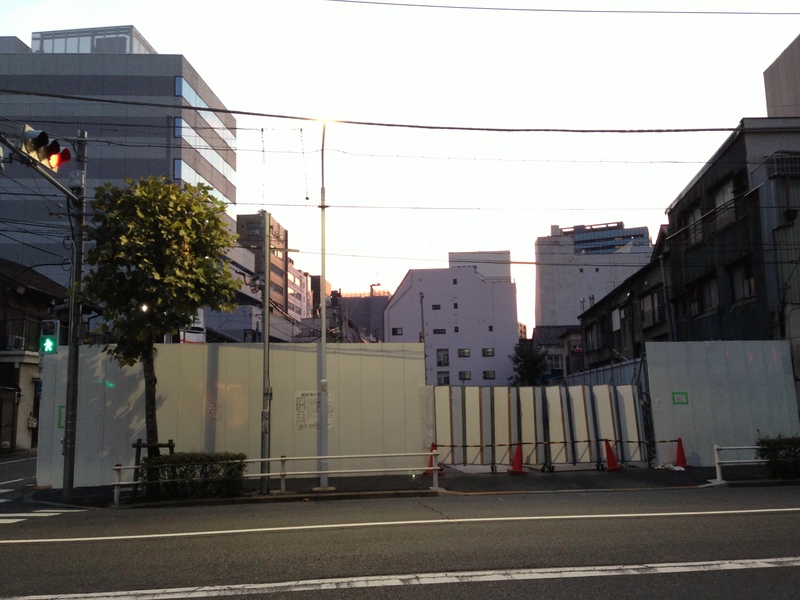 There used to be a standing bar between Inaricho station and Shouta Ramen. It had been renovated, you’d guess during the Bubble era, and a film of grease now covered the minimalist design elements of figured wood, timber counter and brushed steel. The toilet was kind of fancy. Spacious. In the single main room, no chairs and tables, just a cut-pebble paved floor. The exterior was smoothly rendered and painted white, it would have once been a matt kind of sleek. A bit scruffed up now so it fit the neighborhood. 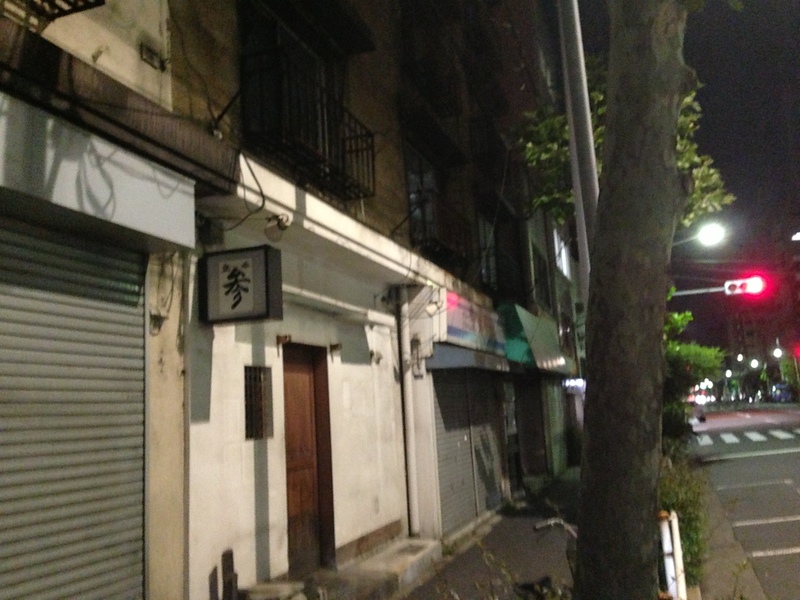 The sign said Tachinomi San, San Standing Bar. Or it could have said “Mairu”. Depends how you read the character. The gruff, big-boned master sat low behind the solid counter along the right side, toward the back, sometimes smoking. When someone ordered he got up and threw it together beside the big sink, or on the high flaming oversized single ring burner. You went there with Knife Cat at the end of winter. She sells knives in Kappabashi and knows a bit about food. It was cold outside. She had on her big sleeping-bag coat. It was a little daunting, stepping in. It looked like locals-only. But what had caught her eye in the small rectangular window was the handwritten sign, “All Food 300 yen”. You had three dishes. Stir-fried early spring cabbage. Kinpira – angular geometric cuts of soy-and-chilli-simmered gobo burdock, konnyaku devil’s tongue, carrot. And something else. All good. A masculine sort of style, not overseasoned. Someone else had a plate of sausages, cut so they flared out like legs of squids. Hahaha. Big splodges of mustard and ketchup. TV was on overhead with some game show. Knife Cat was impressed, which is saying something, and it’s one of her regrets she never got back there. A couple of times you walked past and he was shut, and you figured it was maybe his regular day off, and it was some time before you realised. Maybe because of the white wall, you thought the standing bar belonged to another time and place. 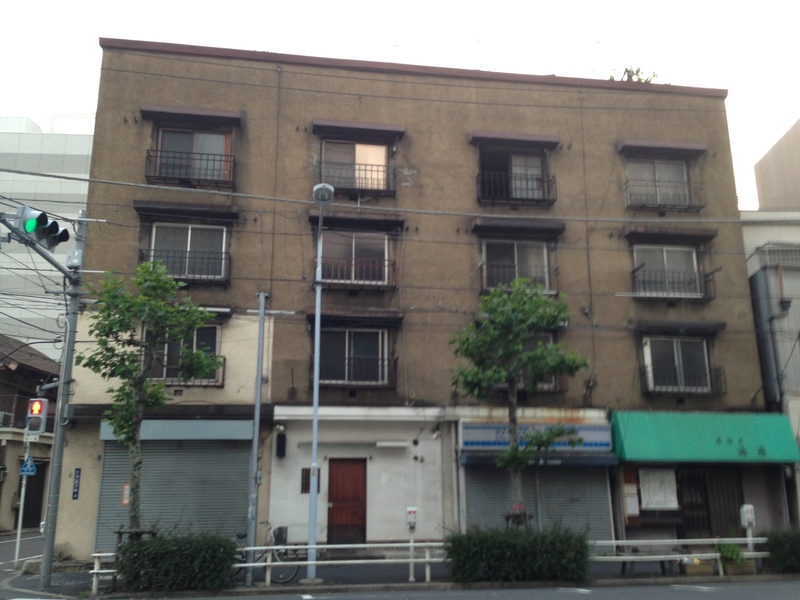 You didn’t figure it was part of the condemned historic 1929 dojunkai public housing complex, the Uenoshita Apartments, whose main entrance was around the corner, and was demolished in June by developers Mitsubishi Estate. The dojunkai was a housing initiative following the 1923 earthquake. It ran until 1941. It drew on European central square design, ferro-concrete and even some input from the likes of Frank Lloyd Wright. He would possibly have enjoyed a bit of devil’s tongue.